First collaborations in 1997 with my composition 'Coriolis Effect' for Reinhold's ensemble Zeitkratzer. Revealed within the massed forces of the group, his unique instrumental voice utilising the raw materials of the piano: bones, teeth, hide. Meetings in Berlin and NYC, more of my compositions played by Zeitkratzer (including 'SyndaKit' and 'Bubblewrap'), many espressos, meals, and discussions. Sooner, a set of recordings in the legendary Tönstudio für Elektronische Musik in East Berlin allowed us to yield some small part of the potential in our intersection, released on the Church of Grob label as ANOSTALGIA. And later, this set of recordings made at the NYC club Tonic during a month-long series of gigs there for my 50th birthday. More sounds and strategies emerge, wider spectra, brighter details, crystalline, dry, wet. "This is the second duo disc recorded by this unique duo. The first was a studio effort on Grob, this one was recorded live at Tonic during a month-long celebration of Elliott Sharp's 50th birthday. There is an obvious sympathetic vibe between these two as both like to manipulate their respective instruments. Dict consists of muted piano fragments, similar to jewellery box serenade with Elliott's subtle string sounds interwoven. Elliott plays oddly mutated soprano sax on Duc as Reinhold taps inside the piano with an object. On each piece the duo do a fine job of matching each other's textural terrain. As Elliott twists those high notes of his soprano on Ject, Reinhold bangs on the high end of the piano, an erupt takes place in the first half, then both men slow down and bend there notes around one another for the second half. Since both of these players are masters of manipulation, it is often difficult to tell who is playing which sound, thus keeping us all guessing at times. There is an undeniable magic at the centre of this as we are often transported to strange new worlds as this long and fascinating disc unfolds. 70 minutes long and consistently engaging." 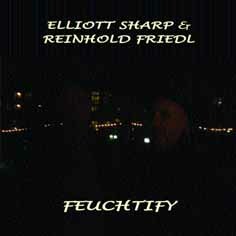 "Thirteen improvisations show the level of affinity that Sharp and Friedl have reached in almost ten years of reciprocal knowledge and fruitful collaboration. The music of FEUCHTIFY seems to harbour evil thoughts one moment and to release uncontrollable urges the next. It never sounds submissive, finding its motivation in radical challenges between rip-roaring, computer-treated sax lines, percussive bounces and metallic clangours. Amidst these insubordinations, the 'regular' piano and guitar notes dwindle away, surrounded by surprising constellations of popping strings and imaginative deconstructions and deforestations. We feel just like a pickup, assimilating these irregular transmissions while pretending to be able to decode them; indeed we know it's impossible, as sound speaks in languages that human brain can only associate to something else. Hungry for words, we could even blather of 'industrial Delta blues', 'pregnant explosiveness', 'dissonant tranquillity', 'rambunctious chattering'. What's really to be noted is the sense of absolute sturdiness of these mechanisms, which seem to have been immersed in a multipurpose liquid substance that renders each of its parts undestroyable. But a careful analysis demonstrates that this substance is the musicians' very essence - which, in the case of Sharp and Friedl, is unquestionably rich. A splendid effort, worthy of repeated spins." "The combination of Reinhold Friedl's piano - prepared or played inside - with Sharp's array of instruments is highly distinctive. The two players are adept at laying down repeated patterns - as close as one could ever get to riffs in freely improvised music - which are frequently complex, but also highly engaging and entertaining. Typically, Friedl lays down the pattern and Sharp both goes with its flow but also acts as a random element, not allowing it to get too comfortable. Once a pattern has been established, you will not be shocked or surprised by any sudden changes of direction. There is development of ideas, but their flow seems logical and unforced, arising from negotiated interactions between the two. The pair embellish and elaborate patterns for as long as seems appropriate. It never feels as if a piece has outstayed its welcome or been flogged to death; rather, one is much more likely to be left craving more of the same as a piece fades out when it seems to have potential for further exploration. This is just as true of Ify, which runs to over eleven minutes and builds to an impressive climax, as it is of the shorter tracks. The pieces have very different sounds and moods, from the pleasing tranquility of the opener, Dict, to the harsher electronic edge of Pel, but they have far more similarities than differences, and there is a feeling of overarching order and coherence to the album." "New York City downtown acolyte, modernist and globe-trotter Elliot Sharp, spins a personalized aura into whatever genre he tackles. A world-class guitarist within blues, avant-garde and jazz-rock environs, he can run with the best of them. Here, Sharp reunites with German pianist/bandleader Reinhold Friedl for a sequence of unearthly duets, as the latter, performs on prepared and inside piano. In addition, Sharp sports his multi-instrumentalist hat during this series of abstracts, teeming with dense layers and off-kilter tonalities. He intermittently injects computer noises that weave in and out of the improvisational flows. On the opening track, the twosome surges forward with childlike innocence, eventually steering matters into macabre-like vista. In other areas, Sharp offsets Friedl's prepared piano manoeuvres with creaky sax-lines as the artists seemingly scratch and claw at each other's exchanges. The various improvs often appear fidgety and raw amid dynamically inclined phrasings, often evoking notions of a neural network with spiking sensibilities. Nonetheless, it's a fascinating listen." "It's agitated molecular music; sonic particles fizz and collide, fuse and develop or dissolve. Friedl delves inside a grand piano and reveals another instrument latent there. Sharp brings his splintering edge to bear on soprano sax and guitars, including dobro and fretless electric. Sounds cluster without losing their singularity - an energy field continuously reconfigured by incessant motion." "Anything but stiff and decorous, the notable performances on this CD, recorded at New York's now-defunct Tonic club, are concerned with pointillism and timbral interaction, and dedicated to cross pollinating the textures from the varied instruments. One prime example of this is Ify, the CD's final track. Initially focused on celesta-styled single-note plucks from Friedl and slurred clatters from Sharp's fretless guitar, a secondary variation includes dense, yet staccato guitar tones with Friedl's response characterized by occasional string slaps from the piano harp. Eventually mooing sound pressure from the computer subsumes the harsh polyrhythmic reverb, creating a conclusive blend. Elsewhere, as on Pend, kinetic but low-frequency chording is created as stopped piano string intonation is mirrored by fretless guitar licks. But this outcome is then used as an opportunity for Sharp to agitate and thicken his playing, turning his output to an infinitely sustained drone. Although heavy metal-like staccatissimo licks also figure into the duo's interaction, the guitarist appears more comfortable exploring what could only be termed an avant-blues style. Mixing knife-edge bottleneck whines with slurred microtonal feints and beneath-the-bridge scraping on Pel, Sharp appears to be detuning the guitar as he plays. Meantime Friedl thrusts individual keyboard pitches forward, stopping and striking the strings to create a multi-hued carpet on which the sharp guitar notes gleam like embroidered gemstones. Other subtle musical coloration include saxophone snorts and trills, metronome-like, clipped piano notes that reference vibraphone bar pressure, piezo-extended frenetic guitar licks and the resonating pressure of what sounds like aluminum plates placed on top of the piano strings. Yet since many of the other wide-ranging timbres are nearly mulched within blurry, triggered signals and computer samples, FEUCHTIFY avoids individual musical braggadocio for essays in sound cooperation. Agile Free Improvisation of the highest standard, the CD exemplifies the strategy of the more adventurous of 21st Century notated composers. Rather than burrowing in their own (usually academic offices) communing only with themselves and their muse, outward looking types are out-and-about, experimenting with individual concepts in the company of other musicians in galleries, restaurants, clubs and even bars."